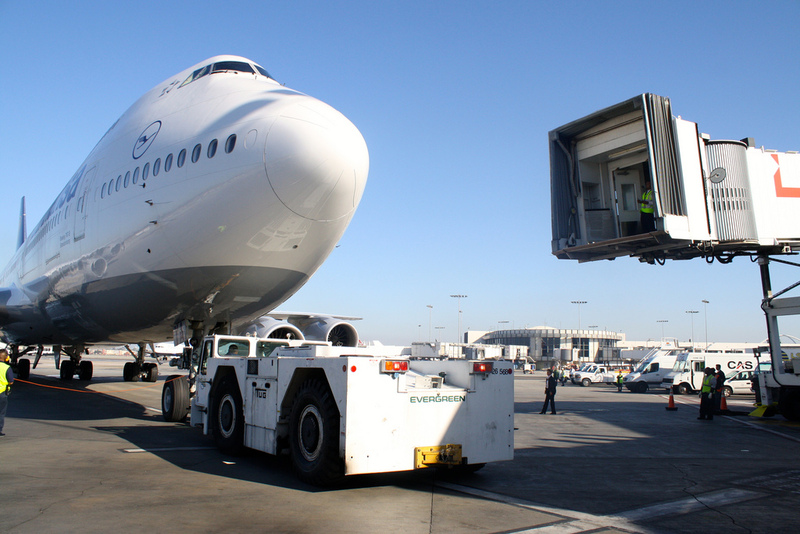 Lufthansa’s Boeing 747-8 aircraft has landed at Los Angeles. 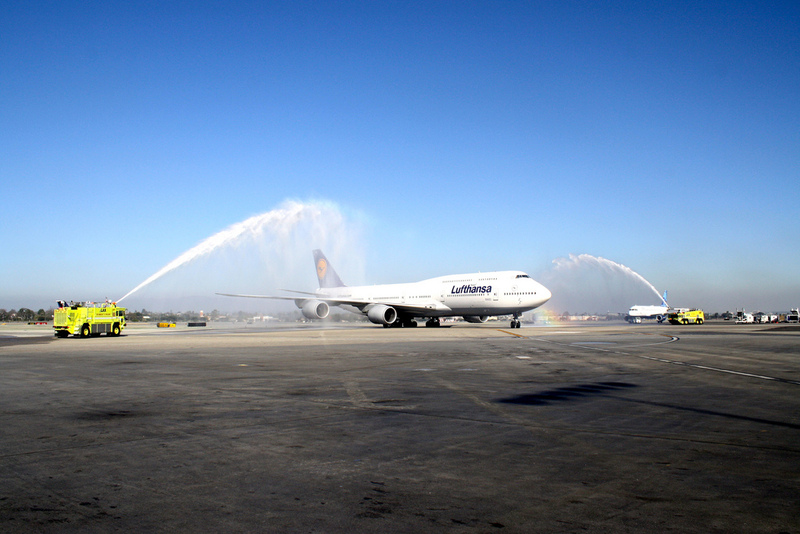 The inaugural flight from Frankfurt, LH456, landed today under bright blue skies and the shimmering of a water cannon salute. 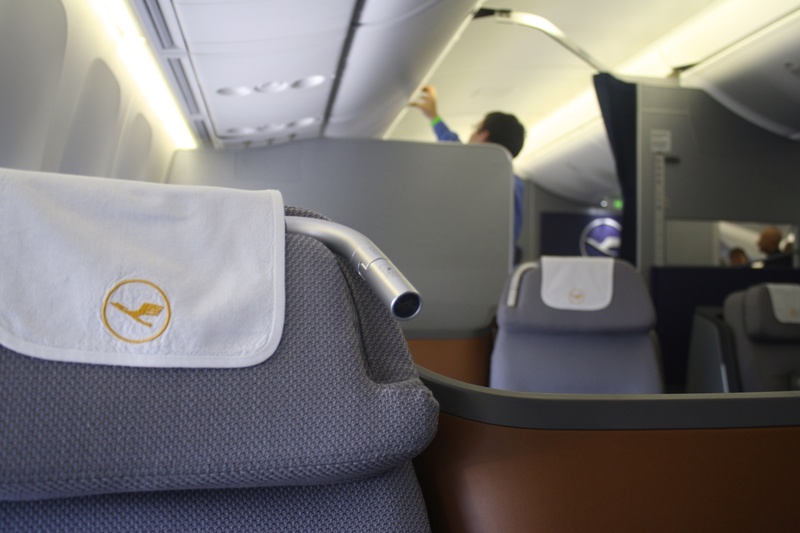 The plane replaces Lufthansa’s Boeing 747-400 on daily LH456/457 service to Frankfurt. 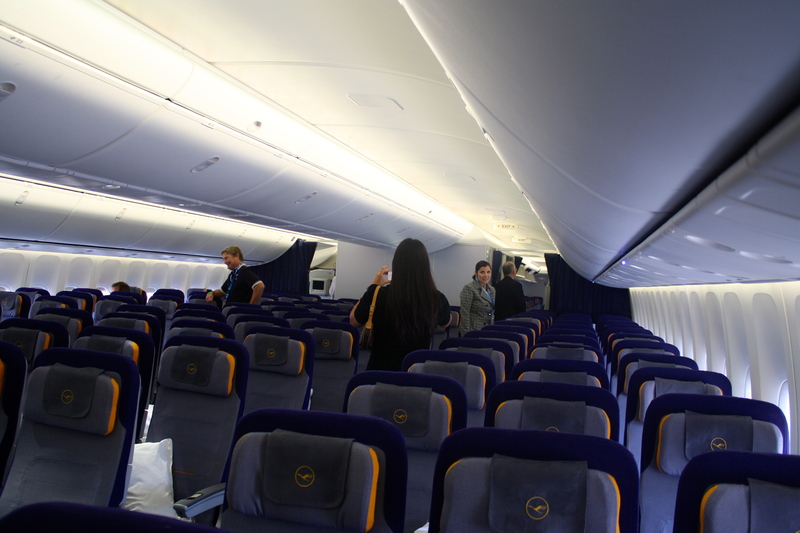 Lufthansa also operates A340 service to Munich. 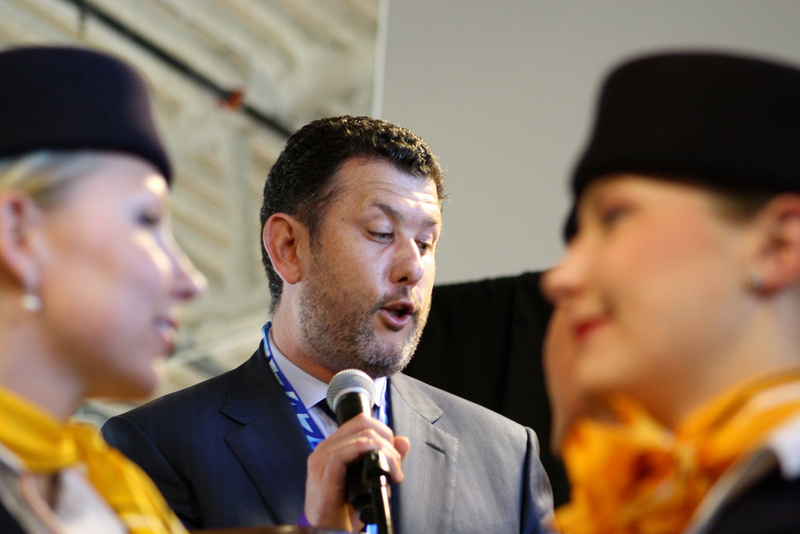 After receiving my wristband and press badge at the dedicated special event checkin desk, journalists and VIPs were sent through security at the Tom Bradley International Terminal. 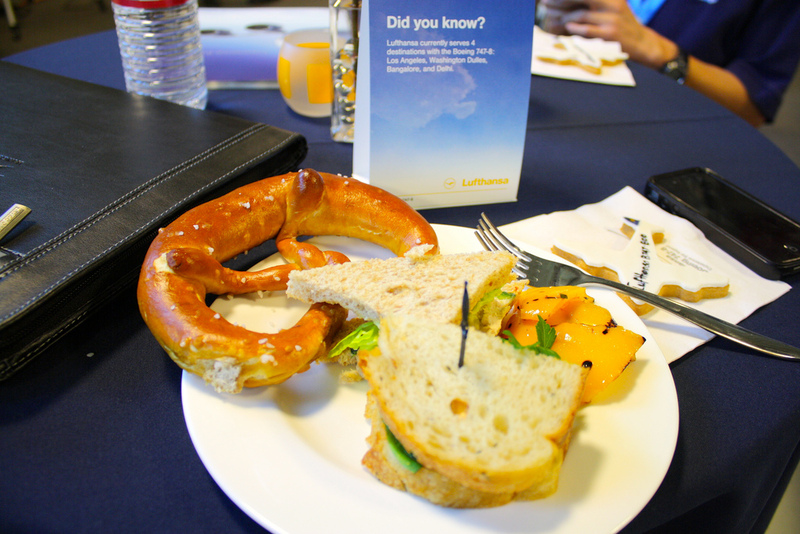 From there, we walked to gate 123, where Lufthansa had set up an amazing buffet spread that featured Boeing 747-8 cookies and delicious German pretzels. After indulging a little bit, we were escorted out to the tarmac to watch the water cannon salute. Weather and industrial action had delayed LH456’s arrival, but no one seemed to notice. 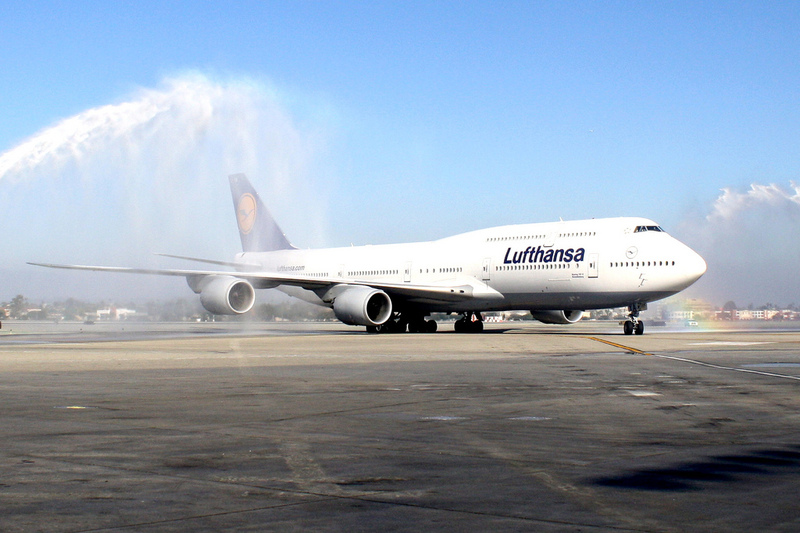 We stepped out into the beautiful Los Angeles sun to greet Lufthansa’s Queen of the Skies. 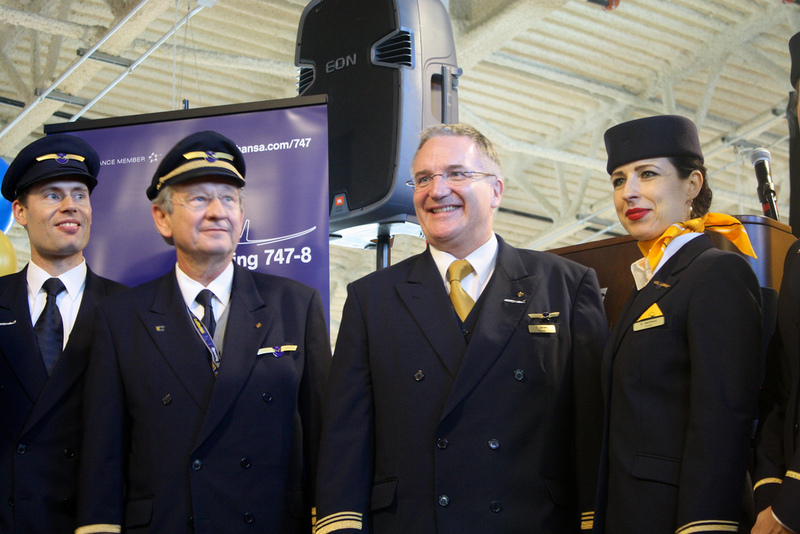 At the ensuing press conference, guests included Deputy Mayor Matt Karatz from the Office of Economic and Business Policy; Elizabeth Lund, Vice President and Chief Project Engineer of the 747 program at Boeing; Los Angeles World Airports Executive Director Gina Marie Lindsey; and Mr. Juergen Siebenrock, Vice President, The Americas for Lufthansa. All in all, a fantastic day for everyone involved. Lufthansa has created a beautiful cabin for Boeing’s glamorous new airplane, which features new, state-of-the-art wings with improved aerodynamics and raked wing tips; new fuel-efficient, U.S.-manufactured GEnx-2B engines that contribute to a reduction in fuel burn, emissions and noise and thus give customers the lowest operating costs and best economics of any large passenger airplane; and fly-by-wire technology. 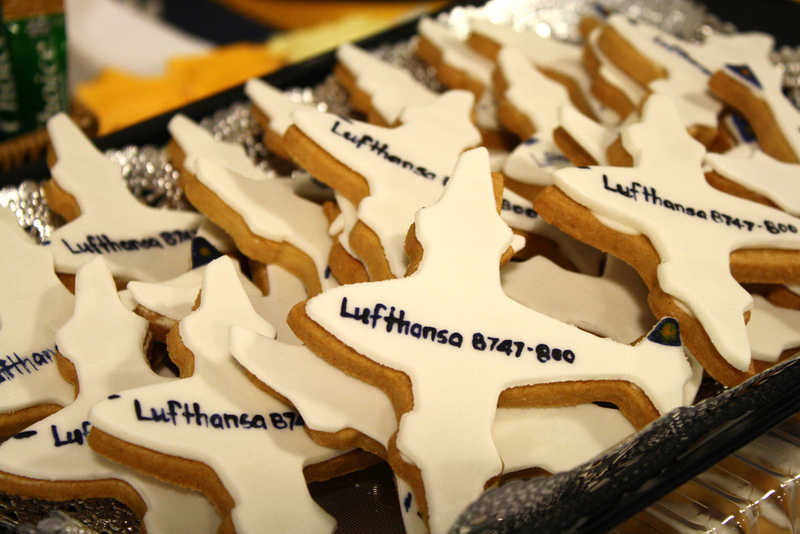 A huge thank you to Lufthansa for allowing us to attend the event! Photos by Taylor Michie / Racing Winds Media. Those Lufty 787 cookies look adorable! What a blast.